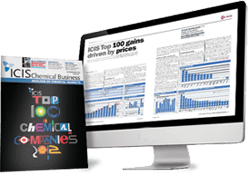 Benzene reports are published weekly by ICIS in Asia, Europe and the US, with contract and spot price assessments, market news and analysis. 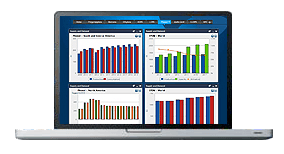 Benzene forecast reports for all three regions are published on a monthly basis, covering the market up to one year ahead. 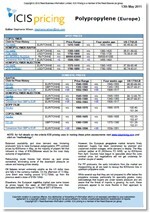 Monthly forecast reports are also available for the Styrene market. Supply remained ample in the market in Q1 with most facilities across the region running normally. The first part of the quarter saw participants in negotiations for 2019 contracts. Terms of the contracts settled on the buyers’ advantage on better discounts obtained as market players expect adequate supply of benzene this year. With the spot East-West arbitrage closed since last year, Asia cargoes continued to mostly circulate in the region. Demand was relatively slow in the first quarter amid the Lunar New Year holidays in the first half of February. Participants in the key Chinese market and across Asia were away for the holiday with demand in a low ebb. At the same time, the ongoing US-China trade war continued to dampen trade although talks were ongoing. Market players mostly remained in a cautious stance, preferring to wait for some concrete announcements to emerge from the talks before making commitments. The supply overhang that has been seen of late in the European benzene market was less pronounced in the first quarter of 2019 owing to some planned and unplanned outages, as well as some delays to logistics. There is also some preparation being done ahead of the busy cracker maintenance period starting in the spring. European benzene demand picked up slightly in the first quarter of the year, as restocking and pre-buying ahead of the spring cracker maintenance period, and as derivative markets will be heading into their scheduled turnarounds. With forward months largely in contango through Q1 2019, downstream players were looking to secure volumes earlier, at a lower price. US benzene supply steadily decreased but remained ample in the first quarter amid refinery maintenance season and decreased gasoline production. Long supply extended into 2019 amid oversupply the previous year. Languishing crude prices, ample supply in the US and globally as well as weak downstream demand prevented prices from spiking during the quarter. Oversupply in Asia also eased any upward pressure on the market, with anticipated new capacity in China at the end of the quarter causing a severe drop in US prices. US benzene demand decreased in the first quarter amid a turnaround at AmSty’s 953,000 tonne/year downstream styrene plant in St James, Louisiana. The plant was on turnaround from the end of January into early March, severely decreasing demand for benzene in the chemical market. Although demand ticked up following the restart of the plant, the subsequent start of LyondellBasell Industries’ styrene turnaround and later force majeure on benzene and styrene at its Channelview, Texas complex further dampened demand. We offer the following regional Benzene analysis and news coverage to keep you informed of factors and developments affecting prices in the Benzene marketplace. Over 25 years of reporting on key chemicals markets, including Benzene, has brought global recognition of our methodology as being unbiased, authoritative and rigorous in preserving our editorial integrity. Our global network of reporters in Houston, London, Singapore, Shanghai, Guangzhou, Mumbai, Perth and Moscow ensures unrivalled coverage of established and emerging markets. Benzene is used primarily as a raw material in the synthesis of styrene (polystyrene plastics and synthetic rubber). Benzene is a colourless, refractive liquid with a characteristic aromatic odour. Its vapour is toxic and highly flammable. In cold weather, benzene solidifies to a white crystalline mass. It is slightly soluble in water, miscible with ethyl alcohol, ether, acetone, carbon tetrachloride, carbon disulphide, and glacial acetic acid (GAA). Benzene is the largest volume aromatic petrochemical used to produce a number of petrochemical intermediates. Ethylbenzene (EB) is the largest chemical outlet for benzene and nearly all is consumed in the production of styrene. The second largest outlet for benzene is cumene which is nearly all consumed in phenol production with acetone formed as a coproduct. The third largest outlet for benzene is cyclohexane (CX) which finds its way primarily into the nylon chain via caprolactam and adipic acid. The fourth main derivative of benzene is nitrobenzene, which can be used to make aniline. Benzene is used to make a number of other chemical intermediates such as alkylbenzene used in detergents, maleic anhydride(unsaturated polyester resins) and chlorobenzenes (engineering polymers). The main sources of benzene are from the steam cracking or catalytic reforming of liquid petroleum feedstocks, primarily naphtha, where the benzene is recovered from the aromatics stream. Other processes are hydrodealkylation (HDA) of toluene and toluene disproportionation (TDP). US Benzene Prices were assessed at $2.75 – 2.83 / gal FOB (free on board) in mid June 2015. 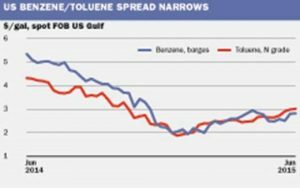 Downstream US styrene outages have depressed benzene prices whilst at the same time fuel blending demand has raised Prices for Toluene to $2.95-3.08/gal. This change has almost eliminated the spread between the two aromatics in the US for the first half of 2015.